And that makes the long-term future of black rhinos even more uncertain, according to new research from T. Michael Anderson, a Wake Forest associate professor of biology who studies the black rhinos living in Tanzania's Serengeti National Park. It's one of the last refuges for this critically endangered mammal. Anderson's new research suggests that better protecting the places where rhinos find their food could be critical to ensuring their survival. "The burning question: does fire affect habitat selection and forage preference of the black rhinoceros Diceros bicornis in East African savannahs?" appears in Oryx: The International Journal of Conservation. 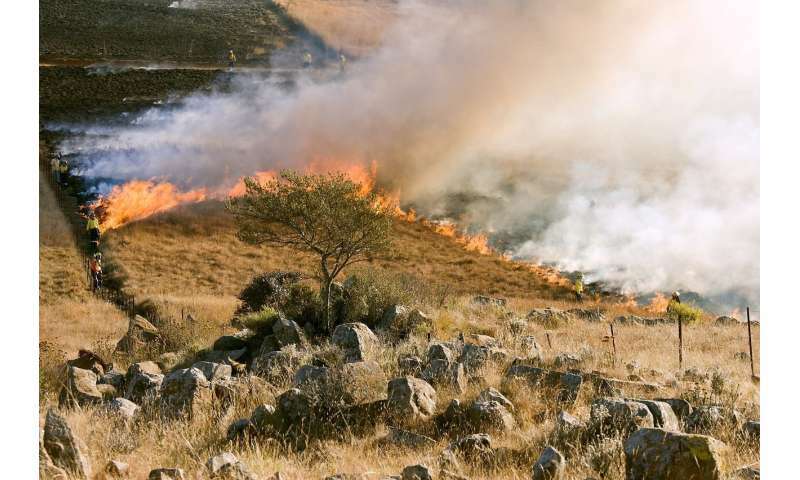 Natural resource managers for the Serengeti use fire as a tool to increase nutrient-rich forage grasses for grazers; keep the bush from overtaking the savannah; and control ticks and diseases. But Anderson's survey of the post-burn landscape shows that such controlled burning doesn't help the woody plants preferred by browsers like the rhinos. The rhinos' size limits what they eat: Their height means they can only pluck the leaves and fruits that grow below two meters on bushes and trees – which are almost always destroyed by the fires. And their range is relatively small; they can't travel distances like their fellow browsers, giraffes and elephants. Of the many hundreds of plant species that grow in Serengeti, black rhinos selectively prefer only about 10. One of their favorites, according to Anderson's study, is Achyranthes aspera, or chaff-flower. After analyzing where Serengeti's rhinos visited and what they ate, Anderson determined that black rhinos preferred to graze in spots that haven't burned in at least 10 years. The park conducts controlled burns at least once a year. Anderson has shared his research with the Serengeti's park warden and suggested a multi-pronged approach to black rhino conservation, including anti-poaching efforts and habitat management. For instance, some places in the ecosystem could be burned less frequently to create patches of woody vegetation for the rhinos to feed on. "We need to acknowledge multiple management goals even if they aren't in line with each other," Anderson said. "Then we need to try to implement a management plan that provides a mosaic or patchwork of solutions."